Not for Transurethral Surgical Procedures. 0.25% Acetic Acid Irrigation USP is a prediluted, sterile, nonpyrogenic aqueous solution suitable for urologic irrigation. It contains no preservatives or added buffers. The solution is hypotonic. The plastic container is a copolymer of ethylene and propylene formulated and developed for parenteral drugs. The copolymer contains no plasticizers and exhibits virtually no leachability. The plastic container is also virtually impermeable to vapor transmission and therefore, requires no overwrap to maintain the proper drug concentration. The safety of the plastic container has been confirmed by biological evaluation procedures. The material passes Class Vl testing as specified in the U.S. Pharmacopeia for Biological Tests â€” Plastic Containers. These tests have shown that the container is nontoxic and biologically inert. The PICâ„¢ Container is PVC-free and DEHP-free. Irrigation of the urinary bladder with acetic acid solution in a concentration of 0.25% has been shown to exert an antimicrobial action against a variety of microorganisms (especially ammonia-forming bacteria) that frequently gain access to the urinary bladder in patients who require prolonged indwelling urethral catheterization. Its antimicrobial action is dependent on administration via the indwelling catheter at a sufficient rate (continuous or intermittent) to maintain an effluent pH of 5.0 or lower. Maintenance of low pH of bladder urine also helps reduce formation of calcium encrustations in the indwelling catheter. 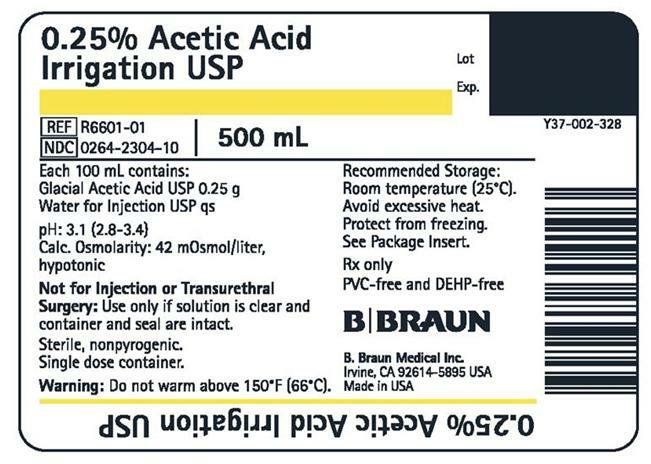 0.25% Acetic Acid Irrigation USP is indicated as a constant or intermittent bladder rinse to help prevent the growth and proliferation of susceptible urinary pathogens (especially ammonia-forming bacteria) in the management of patients who require prolonged placement of an indwelling urethral catheter. It also may be used for periodic irrigation of an indwelling catheter to help maintain patency by reducing the formation of calcium encrustations. 0.25% Acetic Acid Irrigation USP is not for injection. After opening container, the contents should be used promptly in order to minimize the possibility of bacterial growth or pyrogen formation. If pain or hematuria should occur during irrigation, it should be discontinued and the patient reevaluated. Studies with 0.25% Acetic Acid Irrigation USP have not been performed to evaluate carcinogenic potential, mutagenic potential, or effects on fertility. Animal reproduction studies have not been conducted with 0.25% Acetic Acid Irrigation USP. It is also not known whether 0.25% Acetic Acid Irrigation USP can cause fetal harm when administered to a pregnant woman or can affect reproduction capacity. 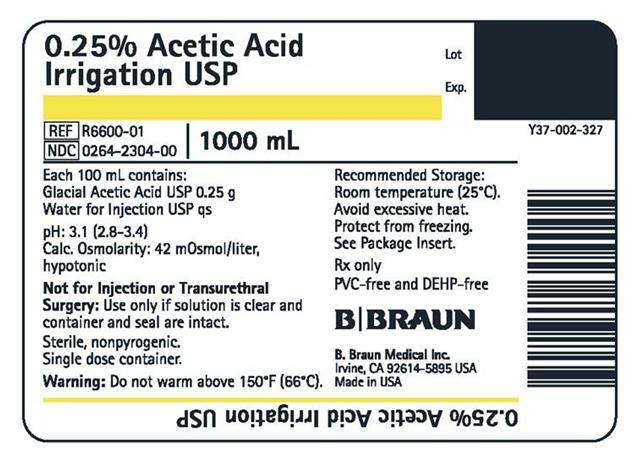 0.25% Acetic Acid Irrigation USP should be given to a pregnant woman only if clearly needed. Caution should be exercised when 0.25% Acetic Acid Irrigation USP is administered to a nursing woman. Clinical studies of 0.25% Acetic Acid Irrigation USP have not been performed to determine whether patients over 65 years of age respond differently from younger subjects. Although systemic absorption of the product is unlikely, greater sensitivity of some older individuals cannot be ruled out. Systemic acidosis, pain, and hematuria have been reported in patients receiving urinary bladder irrigation with 0.25% acetic acid solution. If an adverse reaction does occur, discontinue administration of the irrigant, evaluate the patient, institute appropriate therapeutic countermeasures, and save the remainder of the fluid for examination, if deemed necessary. Systemic absorption is unlikely unless there are open lesions of the bladder mucosa that have gone undetected. In such event, discontinue the irrigation, evaluate the patient for possible systemic acidosis, intravascular hemolysis, and circulatory overload and institute appropriate countermeasures as indicated. See WARNINGS, PRECAUTIONS, and ADVERSE REACTIONS. 0.25% Acetic Acid Irrigation USP may be administered by gravity drip via an administration set connected to an indwelling urethral catheter designed for continuous or intermittent two-way flow. For continuous or intermittent irrigation, the rate of administration will correspond roughly to the rate of urine flow and should be adjusted to maintain a urinary effluent pH of 4.5 to 5.0. Nitrazine or other pH paper may be used to monitor pH, preferably at least four times daily. Drip rate should be adjusted as necessary to maintain desired pH; increasing flow rate reduces pH value and vice versa. With continuous or intermittent irrigation, each patient will require a volume of approximately 500 to 1500 mL per 24 hours. 0.25% Acetic Acid Irrigation USP is supplied sterile and nonpyrogenic in 1000 mL and 500 mL PICâ„¢ (Plastic Irrigation Containers) packaged 16 per case. (b) Invert container and inspect the solution in good light for cloudiness, haze, or particulate matter; check the container for leakage or damage. Any container which is suspect should not be used. Single dose container. Discard unused portion. 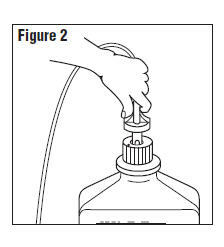 Outer Closure Removal â€“ Grasp the container with one hand and turn the breakaway ring counterclockwise with the other hand until slight resistance is felt. Then, twisting the container in the opposite direction, turn the breakaway ring sharply until the entire outer cap is loose and can be lifted off. 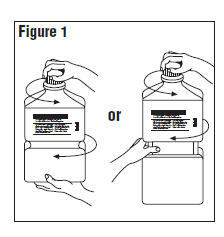 Connect the administration set through the sterile set port according to set instructions or remove screw cap and pour. Do not warm above 150°F to assure minimal bottle distortion. Keep bottles upright. container and seal are intact. Warning: Do not warm above 150°F (66°C).